The PC290 is a practical, comfortable cycling glove. Lycra backing provides a snug but forgiving fit. 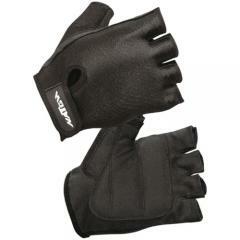 Made with Clarino synthetic leather, this glove is washable. Reinforced foam padding in the palm significantly reduces vibration and trauma to the hands and wrists, while also providing excellent grip. A terry cloth section on the back of the thumb can be used to wipe away perspiration.